Aldine Improvement Board met last Tuesday evening, and a large portion of the business was reconstituting the board, due to resignations and departures. Five appointments were made to the board, including new members Bob Beasley, John Beaudion Jr., James Murnane, and reappointments of Reyes Garcia and Clyde Bailey. The new members include Bob Beasley of Beasley Tire Company, John Beaudion Jr. from Commissioner El Franco Lees Precinct One office, and James Murnane, president/CEO of North Houston Bank. However, none of these appointments are official, and they are all subject to ratification of the Harris County Commissioners Court, and could possibly be revised, AID officials noted. The board has a total of 9 members, so this means 5 are new appointments or reappointments. One person died and two others were injured when a Dodge Spirit collided with an Aldine school bus Wed. Feb. 11 at 4:40 p.m. The bus was traveling northbound on Vickery and turning left to go westbound on East Mount Houston. The initial police report said the bus failed to yield the right of way. The Dodge Spirit was traveling eastbound on East Mount Houston when it struck the right side of the bus. The three passengers in the spirit were injured. The front passenger died later that evening at Ben Taub from injuries sustained during the accident. The bus was empty except for the driver. All the students had already been dropped off and the bus was heading back to the garage. The Harris County Sheriffs Department is still investigating the accident, according to Aldine ISD public relations officer Mike Keeney. Aldine Y.O.U.T.H. lost half of its budget last fall, but that hasnt stopped them from expanding. In November the community center which has been designated a Violence Free Zone learned that it would lose a grant from the National Center on Neighborhood Enterprises. The nature of the grant had changed and Aldine Y.O.U.T.H. no longer qualified for the monies. Rather than let that the significant blow get them down, the board of directors decided to look at this challenge as a blessing in disguise. I look at the funding that left us as an opportunity for new growth where people can come and plant their seeds and let it grow. I hope the grant we lost can be replaced with abundance, said Sylvia Bolling, founder and director at Aldine Y.O.U.T.H. Though they have yet to make up for the lost grant, the centers board of directors decided to move ahead and start a long awaited resale shop on the property. For the last year, Bolling has been planning a resale shop for the area, which she says desparately needs one. Money made by the business will help to keep the centers doors open. It will also serve as a hands-on internship for teens in the soon to be formed Taking Care of Business Youth School (TCB). A fun atmosphere, great food, and reasonable prices keep diners coming back for more at the Mambos family of restaurants. As soon as you enter the door at Mambo Seafood, you know you are in for a good time. A brightly-lit jukebox in the middle of the room fills the bright, open dining room with upbeat tunes. The cocktail bar, neon lit signs, and condiments stored in 6-pack holders at each table gives Mambos an icehouse feel. But the restaurant is a family-friendly place for anyone to go for a good time. The restaurant offers a non-smoking section inside or customers may smoke out on the patio under multicolored umbrellas. The patio is really the big thing at this location. When youre driving down the freeway, it looks like, This is a fun place. I really want to be there, said general manager Joel Moreno. The food tastes as good as the place looks. Fresh seafood is displayed on ice at the counter. Customers can buy by the plate or by the pound. This is like a fish market. You can buy it either fresh or we can cook it for you, Moreno explained. Lobster Ranchero, oysters on the half shell, and grilled or fried shrimp are the top selling plates. Everybodys been telling me about the scampi shrimp, said one patron visiting from San Antonio. His friends told him he had to come to Houston to eat at Mambos. A constant favorite with customers is the fried seafood combos. 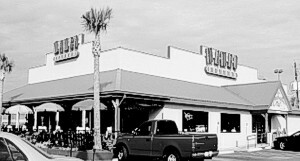 Diners take their choice of one or two items and get sides of fries and Mambo shrimp rice for just $7.95. No matter what your choice, a side of Mambo shrimp rice is an excellent addition. Made fresh when you order it, this fried rice flavored with Mambos secret spices is sure to keep you coming back. Residents in North Forest will try again later this month to meet with the developer of the Woodland Village Subdivision who they say is changing the nature of the project he promised to the community. In April 2003, residents met with Joe Fogarty, president of Arete Real Estate Development at Grace Cathedral Church at a Northeast Community Empowerment meeting. Residents say that at that time, Fogarty presented them with a plan to develop the land with over 900 Royce built homes. We know that home ownership stablizes a community and the community tentatively supported the project, explained Jackie Mayhorn, president of Super Neighborhood #47. According to Mayhorn, Fogarty then asked City Council to support a lease to purchase subdividion on the 236-acre tract. According to a report from a Northeast Beyond 2000 meeting, At a Housing Initiative Committee meeting that was chaired by Council Member Gordon Quan, the developer stated that 5,000 to 6,000 homes in six subdivisions throughout Houston would be made available through a lease to purchase program underwritten by Freddie Mac. Residents are concerned that a lease to own development would destablize the community. Mayhorn said research shows homes in such neighborhoods experience high ownership turnover. City council members have tagged the project so that the community can have time to collect more community feedback on the project and information. Community members organized a meeting for Feb.2 to discuss their differing ideas of the project. However, Fogarty did not attend the meeting. Instead, Scott Brogan, president of The Kaleidoscope Group met with the residents to hear their concerns and take them back to Fogarty. The civic groups planned another meeting with Fogarty for Feb. 19 at 7pm at Grace Cathedral Church. I think its in his best interest to be there this time, Mayhorn said. ALDINE The Improvement District continues to make progress on their goal of a water and sewer plan for the area, to be implemented by the year 2020. The District is planning to spend approximately 250 million dollars on new water and sewer lines, according to AID President Clyde Bailey. This will include a new 24 water line looping through the area to feed smaller distribution lines, and a new sewer line that will eventually hook up with either the Citys sewage plants, such as the one at Hirsch and Beltway 8, or smaller package plants built throughout the area. At their meeting on Jan. 20th, the AID board heard an update report from Water Engineers, Inc., who are working on the plans to meet government requirements. Bailey has noted that the sewer and water lines will be a catalyst for renewal and reinvestment in the Aldine area. We need adequate water and sewer along the 59 corridor. This will bring business back, Bailey is quoted as saying. In a related development, last week Congressman Chris Bell announced new funding totaling over $63 million for flood relief in areas of North Houston.